The version 4.0 code release resolves outstanding issues regarding data display and the functions to facilitate returning offenders to a sending state. Released April 29, 2009. Criminal case information, including supervision start and end dates, displays correctly. Unaffiliated or inactive criminal cases no longer populate. Financial obligation information displays on the ‘Preview’ screen for the Transfer Request. Workflow processes for offenders returning to the sending state such as Reporting Instruction Information, Notice of Departures and Notice of Arrivals work as intended. The name of the user who withdraws a compact case displays in the offender’s profile. Withdrawing a case removes the case from the active workload. The inactive case information is accessed by selecting the “Show Historical” checkbox within the Compact Cases tab. The number of default records displayed increased from 100 to 500. 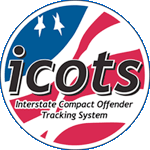 ICOTS offender number is displayed in the offender’s profile. Offender’s middle name(s) displays within the offender’s profile. Offender’s phone number displays within the offender’s profile.